www.portal.npvn.ng | Apply 2017 Npower Registration (Application) - Latest information today about the Npower application portal shows that the main link to apply for Npower Recruitment is http://portal.npvn.ng/apply/index.html. See all the N-POWER Programmes Here. 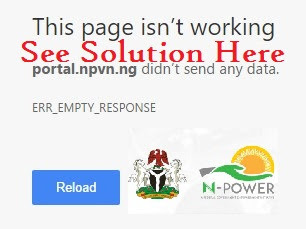 Updates: It has been noted that the npower portal that is supposed to open by 11:30pm Tuesday night whic is 13th June 2017 has refused to load or open. Since the news was published in the news, on social media platforms and private blogs, it is expected that thousand, if not millions of people will want to open the website and apply. However, its about 12:06am 14th June (Wednesday morning) and the website is still not opening. People have been asking us; is that the engineers are still working on the portal or the hosting service has exceeded its bandwidth limit? Npower remains the only people that can answer that question. Subscribe now and we will give you fresh updates and latest news on about Npower application Portal. More updates are on the way.